If you are interested in Birding Paris and Brittany France, come and join us at Kaiyote Tours! Paris is one of the art centers of the world. Not just for the collections that the museums hold, but for the inspiration is still gives to artists today. We start and end this tour in Paris, such an amazing city to see. We will be taking the train to Brittany and spend 5-days visiting three very idyllic and historic villages: St-Malo, Saint Suliac and Mont Saint Michel. Each day there will be time for birding, walking, exploring and learning. Where a better place to enjoy crepes and the French countryside, but in Brittany? 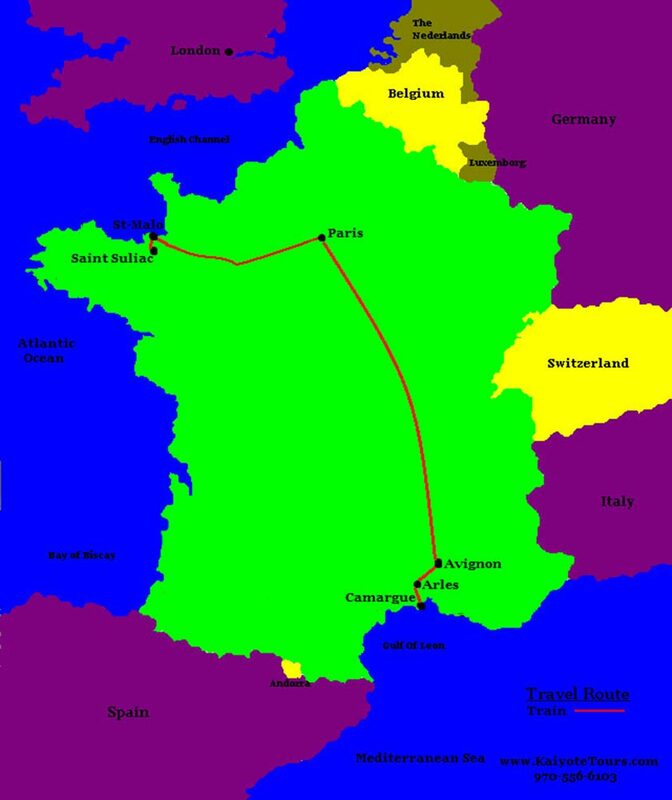 You will enjoy this tour if you only wish to see Paris, Brittany, walk the land and enjoy the sights. You will enjoy this tour if you only wish to see the birds of Brittany. Voila!! It is three-hour train ride to St-Malo on the TGV. The TGV (pronounced tay-zsah-vay) is one of the fastest trains in the world and can travel over 200 miles an hour. We will be staying in the heart of the old town and there will be plenty of time for walking and sightseeing within the city walls and along the beautiful beach. St Malo is also a great place for shopping. St-Malo is a beautiful walled fortress and city. Construction of this amazing place began in the 12th century. St Malo was home to François-René Chateaubriand (1768 – 1848) who is considered the founder of Romanticism in French literature. Jacques Cartier (1491 – 1557), an explorer who claimed what is now Canada for France, was from St Malo. St Malo has also been the home to many pirates… years ago. St Malo is located at the mouth of the Rance River and is a fishing and sailing area as well. On this day will take a day trip to the amazing Mont Saint Michel in Normandy; this ancient and massive abbey is a sight to see. Starting 1200 years ago, this village and abbey is built on an island that is revealed when the tide comes in. Six miles up the Rance River valley from St Malo is another fishing and sailing village called Saint Suliac. We will be staying at a small and beautiful B&B in the village. St Suliac is a very old village founded nearly 1500 years ago by a Welsh monk who came to spread Christianity to the area. The quaint and picturesque village of Saint Suliac is nice for walks and nature. There are trails that lead in both directions from the village, along the river. The Rance River estuary is at its widest at Saint Suliac (1.3 miles), creating splendid landscapes between the rolling green hills and the deep-blue water. Saint Suliac was recently listed among the most beautiful villages in France and its architecture is protected by national laws. It is a 3.5-hour train ride back to Paris on the TGV train. We will have time in the afternoon to visit the Rodin Museum, Musee de l’Armee des Invalides and/or birding locations of your choice.